Posted in: Bug Info, Ether Saga. 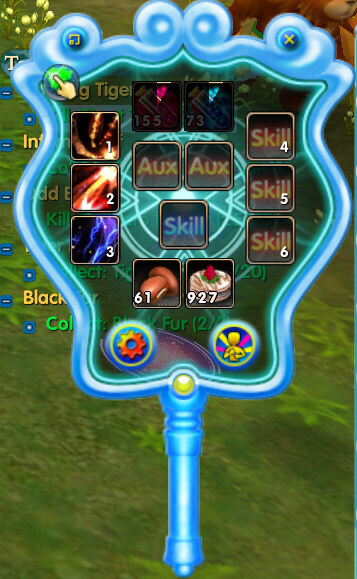 Looks like the native skills of pets don’t level up when they should. Here is a stout tiger at level 20 still awaiting his level 20 upgrade on his native skill. 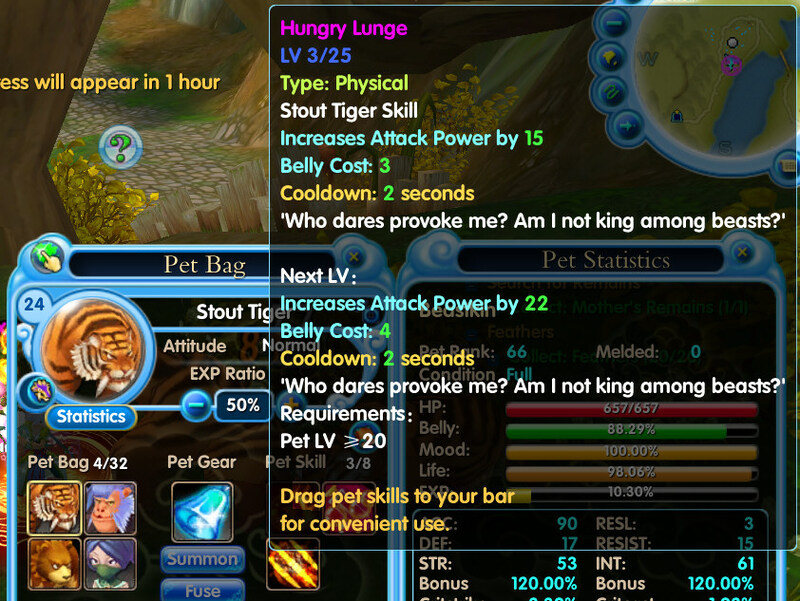 ANSWER: This is a “chance” that a pet will level a native skill when it levels up. Stuck Quest – How Can It Be Canceled? As I have taken 3 characters through Ether Saga to levels about 20, I have made some mistakes in how I have done the quests. Two of the characters reached the mid 20’s before I began to go back through the training quests to find the Cloud glide mount. When I did that, for one of the characters I took a quest that I have not been able to complete or remove from my Quest dialog. 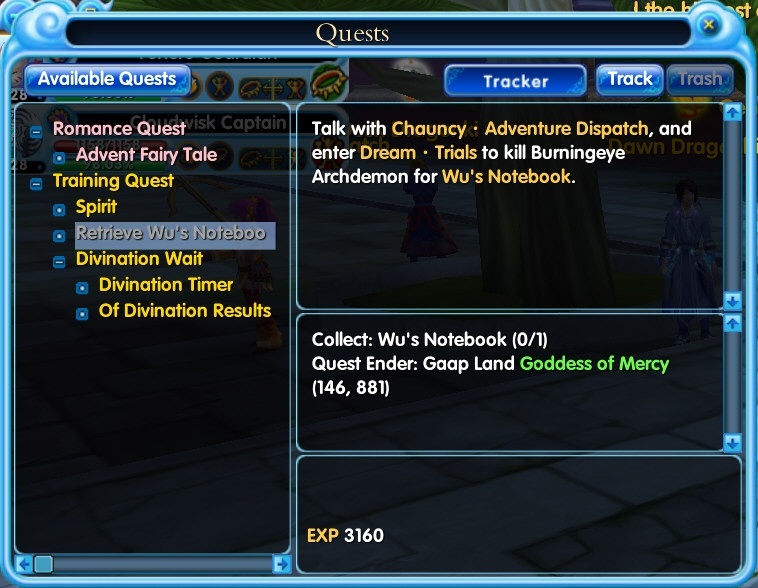 As you can see here, the quest “Retrieve Wu’s Notebook” cannot be removed since the “Trash” button is Disabled. However, the quest cannot be completed by the level 28 [at the time] character because the character receives no drops in the dungeon. The dungeon boss was killed – after quite a bit of effort – and there was no drop of the notebook. On attempting the quest a second time, the helper quests in the dungeon were attempted. These quests give drops of a transform card or other items to make it easier to kill the boss. After killing perhaps a hundred low level characters in the dungeon, no drops occurred. Is there a way to remove this quest from the quest panel? Obviously it cannot be completed. ANSWER: Apparently no way except to purchase a Wu’s Notebook. Possessor Pickup Filter Features not working. 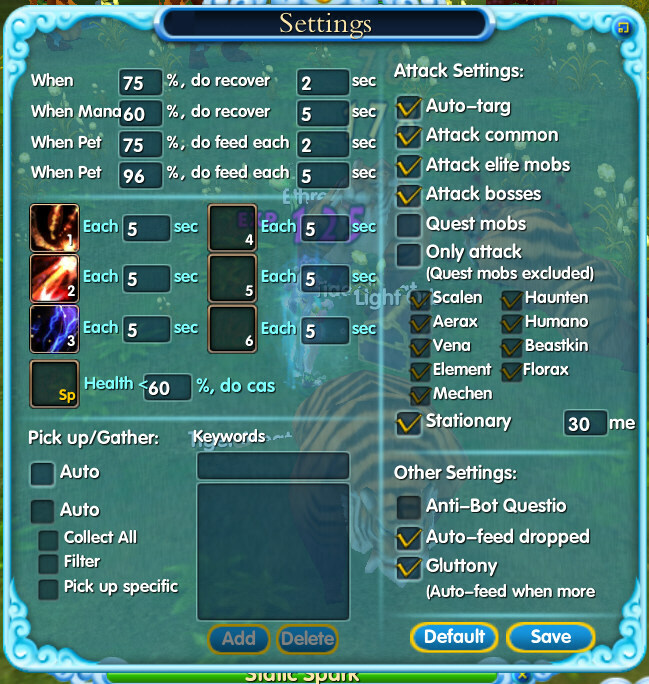 Here are the settings. Note that the Auto Collect features are disabled. ANSWER: Must use a Jadeon of Soul in the AUX slots for pickup to work. I played Ether Saga for a few days last year, and didn’t like it much then. Not sure if things have changed or whether I have discovered new features. But it’s a fun game actually. SandyLight and her starter pet. I recently have gotten bored with Guild Wars – more on that in another post sometime – and since 2Moons has been hit by a comet, I decided to try Ether Saga again. AKIA was fun for a day or so, but it has a very high attention load as you level and quest. So it’s tiresome to play. AIKA is a recently released Free-To-Play MMO. You can find it here for the United States and here for other nations around the world. You should be careful to get your client from the correct place, or it will not work – I learned the hard way. The Global site isn’t very forthcoming with the information about the countries it supports. It’s there, but not obvious. My experience in AIKA is mixed. [I have no idea how to pronounce this. I guess it does not translate easily from the Korean.] 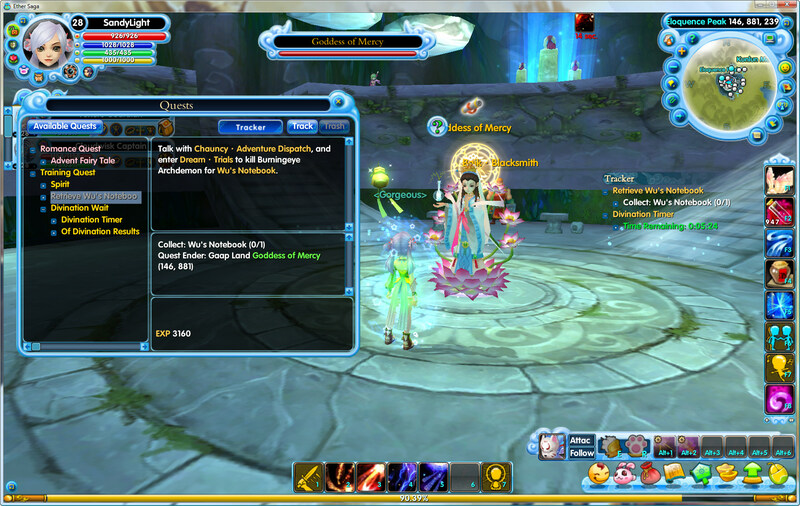 There is a Wiki for AIKA, which has much useful information, but is not nearly as complete as the one for Guild Wars. Posted in: 2Moons, Games, MMOs. On 26 August 2010, the planet of 2Moons was hit with a comet and all life was extinguished. The event was unforeseen. Since astronomy is not a popular endeavor in 2Moons, because folks are too busy with the grind of leveling up, nobody saw the comet coming until the planet had been hit and was completely destroyed. There are rumors that the neighboring planet of Playdom, maker of those lousy little browser based time wasters in Facebook and Twitter, actually steered the comet toward the world of 2Moons, but this is only a rumor.